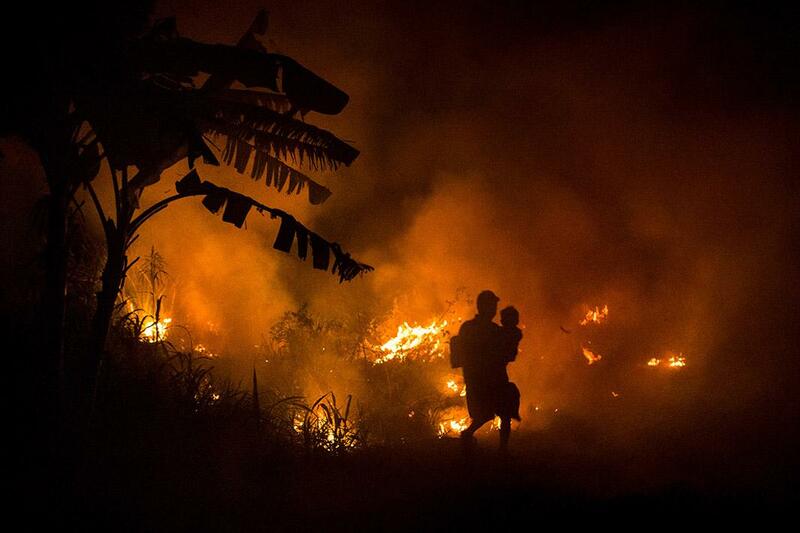 Indonesia’s fires: an environmental catastrophe and a climate change nightmare. 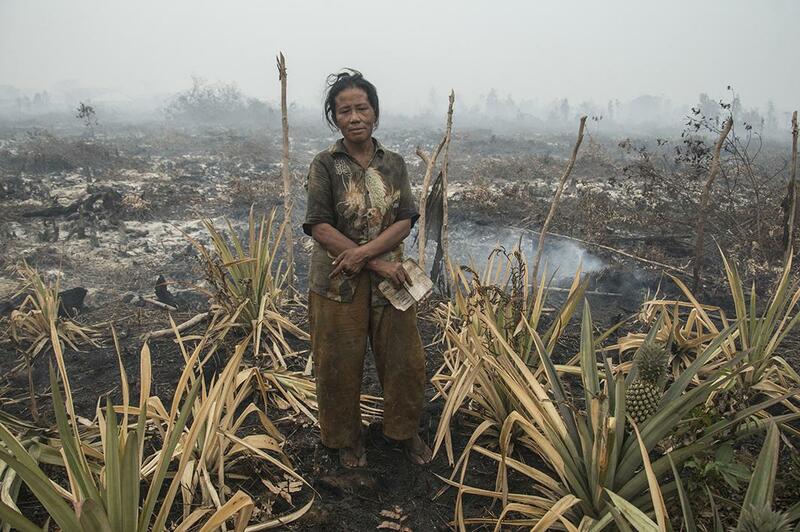 Indonesia’s fires are an environmental catastrophe and a climate change nightmare. A man carries his son through the haze on the way to his house as a fire burns peatland on Oct. 2, 2015 in Palembang, South Sumatra, Indonesia. These fires are particularly harmful to the environment since they are peat fires, which emit up to 10 times more greenhouse gases in the form of methane gas than fires on other land. 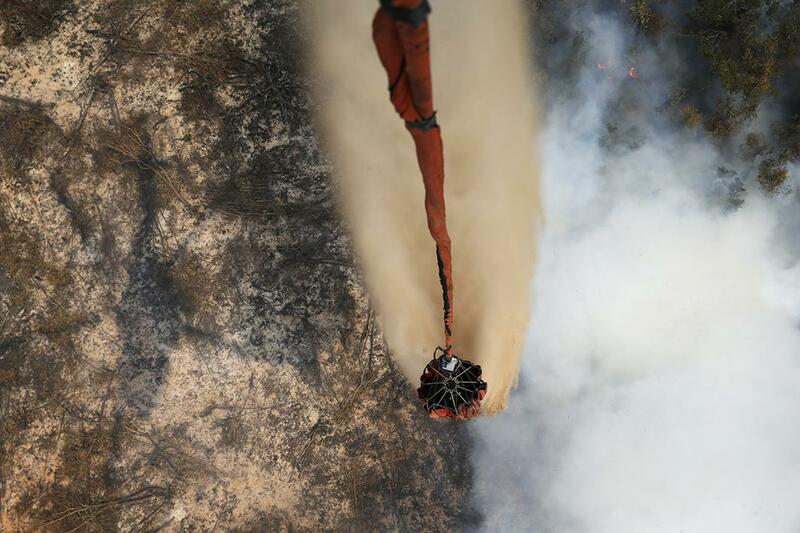 NASA satellites have detected more than 117,000 individual fires this year alone. 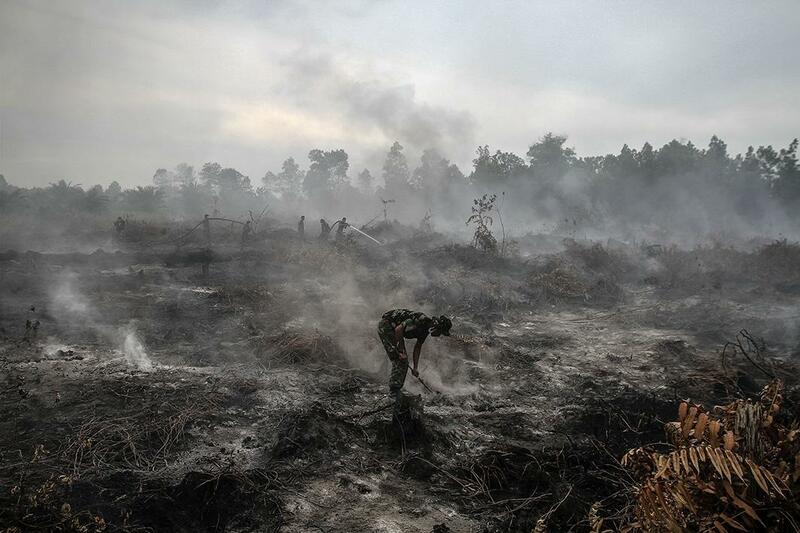 Indonesian fire fighters try to extinguish a forest fire in Riau Islands, Indonesia on Sept. 5, 2015. 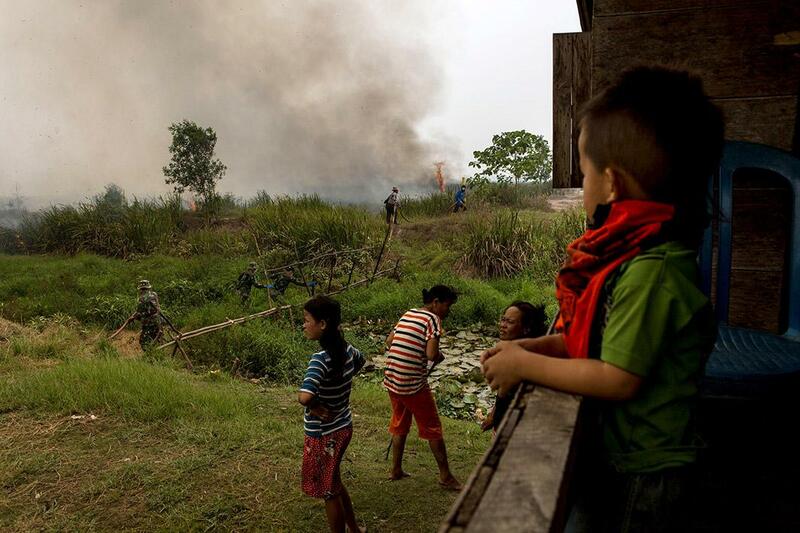 Villagers watch as Indonesian soldiers extinguish a fire near their home on burned peatland and fields at Sungai Rambutan village, on Oct. 2, 2015 in Palembang, South Sumatra, Indonesia. Air pollution has been an annual problem for the past 18 years in Indonesia. It’s caused by the illegal burning of forest and peat fires on the islands of Sumatra and Borneo to clear new land for the production of pulp, paper, and palm oil. 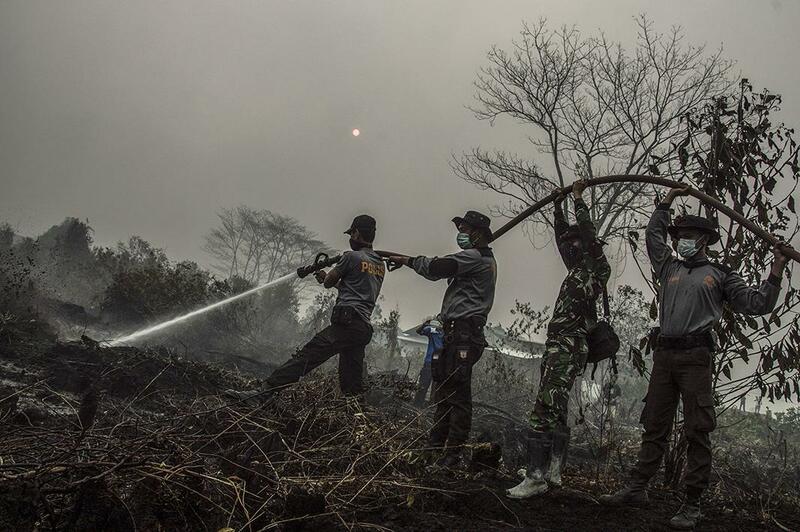 Singapore and Malaysia have offered to help the Indonesian government to fight against the fires, while authorities are conducting investigations of hundreds of Southeast Asian firms in connection with these. Neighboring countries and the entire international community have been putting more pressure on Indonesia to control the fires ahead of the United Nations Climate Change Conference in Paris this week. 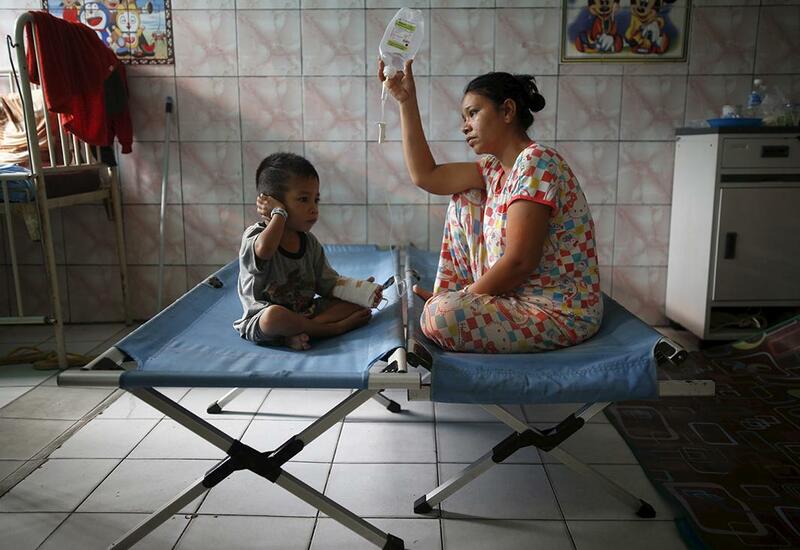 A mother sits with her son who is recovering from a respiratory illness in a hospital in Palangkaraya, Central Kalimantan, Indonesia, Oct. 28, 2015. 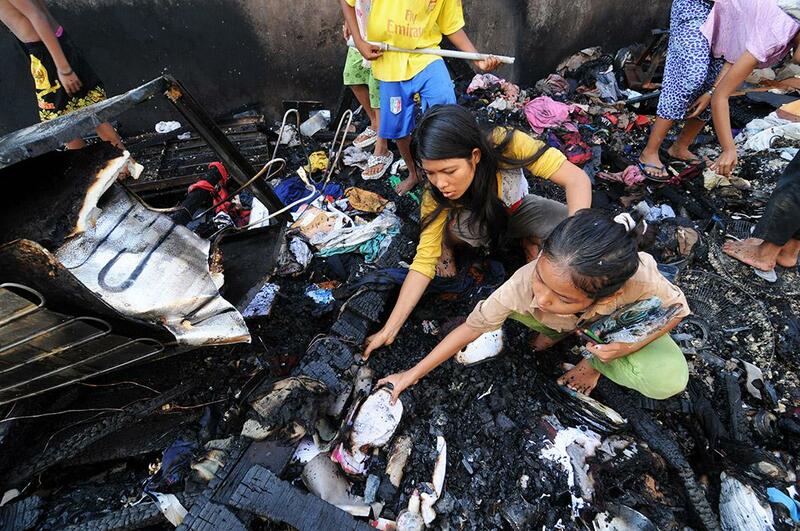 Fire victims salvaging their possessions from the debris of fire that burnt six homes in the village of Mon Geugong without casualties, on Aug. 8, 2015, Lhokseumawe, Aceh, Indonesia. 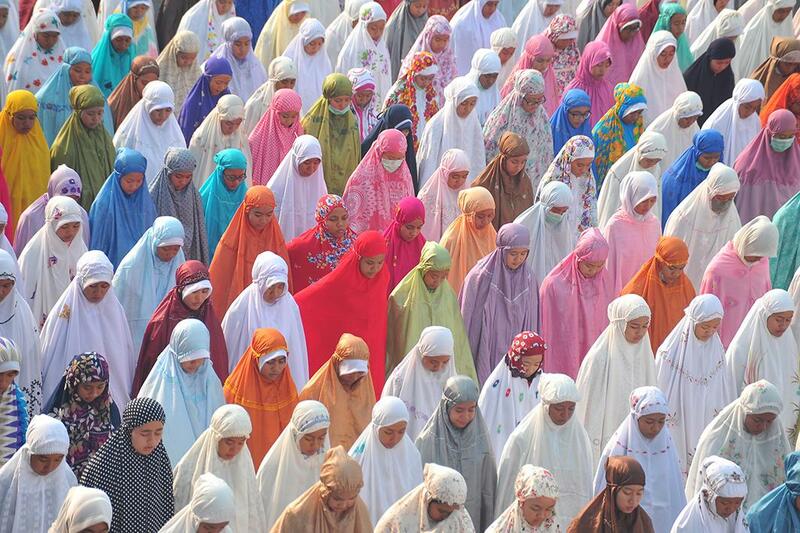 Muslim students pray for rain to put out the fires that enveloped the region at Palembang 1 senior high school in Palembang, South Sumatra, Indonesia, Sept. 17, 2015. 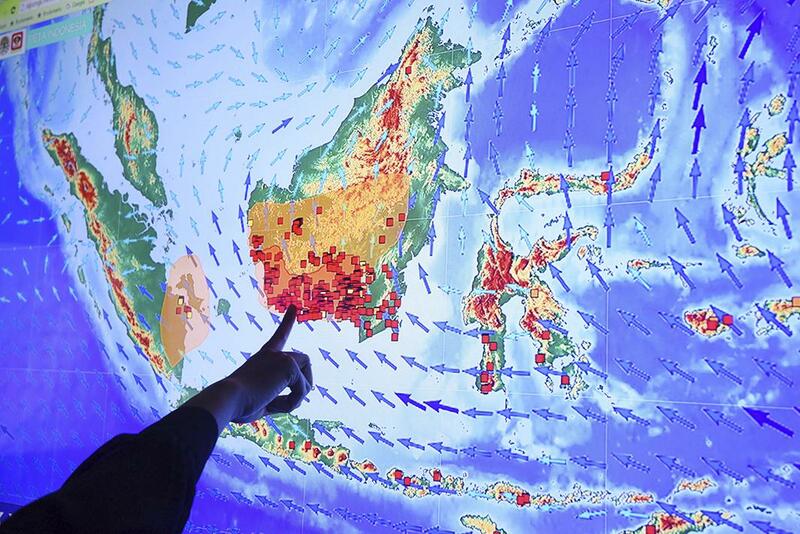 An officer points to fires or hot spots in Kalimantan, Indonesian part of Borneo, on a screen at the Fire Command Post at the Ministry of Environment and Forestry in Jakarta on Sept. 22, 2015. 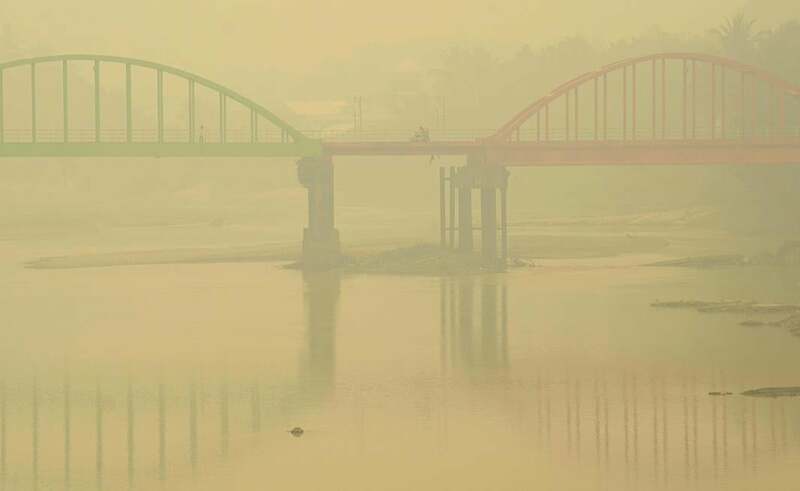 A resident rides a motorcycle on the haze-shrouded Betrix Bridge in Sarolangun, in Indonesia’s Jambi province, Oct. 7, 2015. 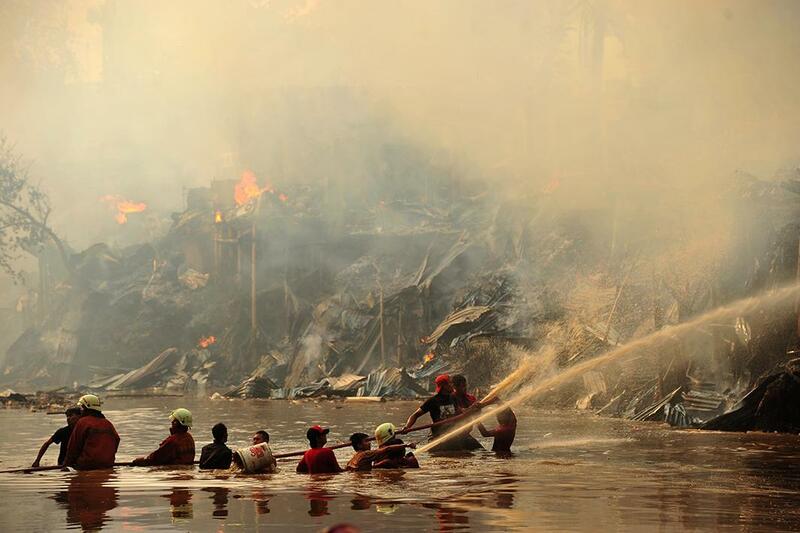 Residents and firefighters try to extinguish a fire burning temporary houses at a riverside slum in Jakarta, Indonesia, Sept. 2, 2015. An Mi-17 helicopter dumps water on a burning forest at Ogan Komering Ulu area in Indonesia’s south Sumatra province, Sept. 10, 2015. 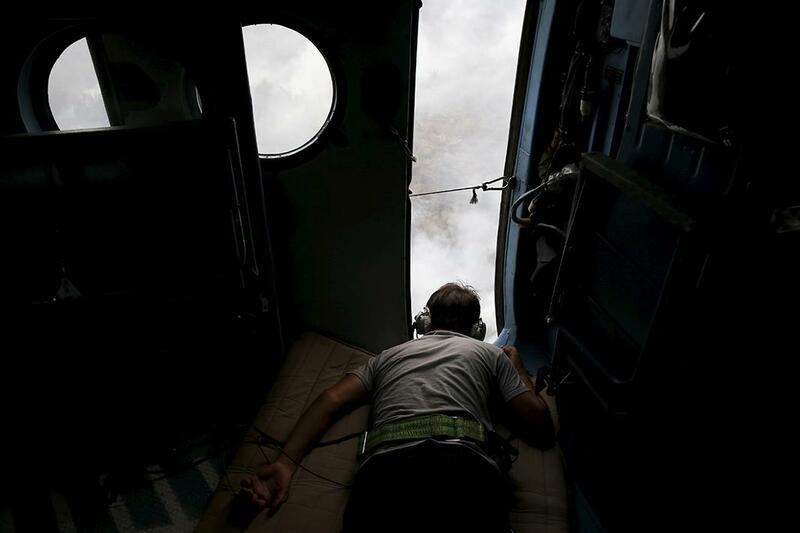 A crewmember of a Mi-17 helicopter lies on the floor of the chopper as water is dumped on a burning forest at Ogan Komering Ulu area in Indonesia’s south Sumatra province, Sept. 10, 2015. 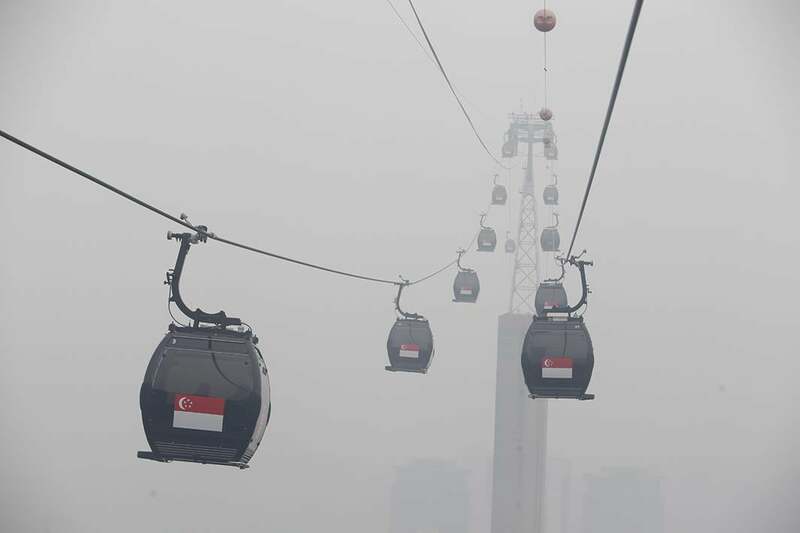 Cable cars moving towards the island resort of Sentosa are shrouded by haze in Singapore, Sept. 29, 2015. 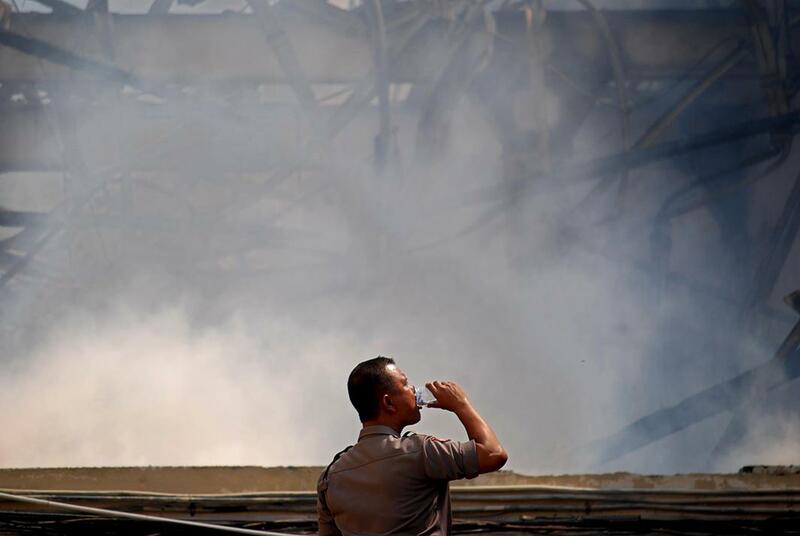 A police officer drinks water as he takes a break from extinguishing fire at the police headquarters in Semarang, Indonesia’s Central Java province, Sept. 30, 2015. 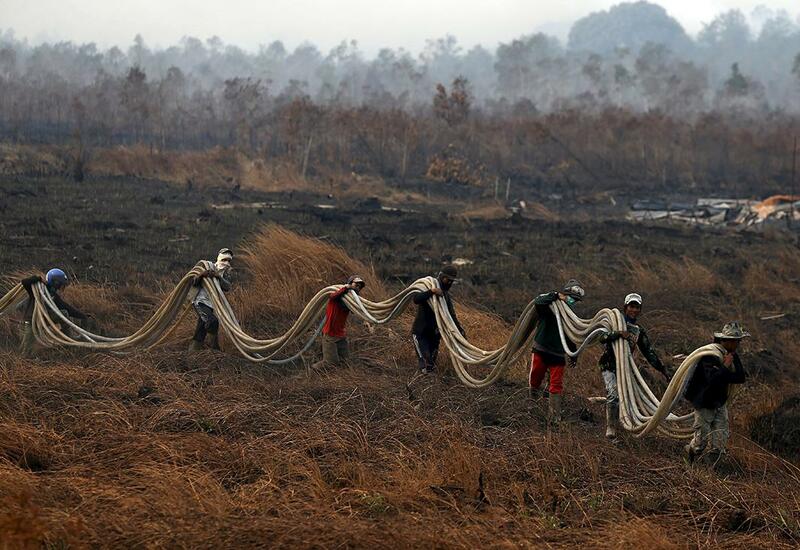 Workers bring water pipes to extinguish fire as they walk through a burnt palm oil plantation at the Pulo Geronggang village in Ogan Komering Ilir district in Indonesia’s South Sumatra province, Sept. 11, 2015. 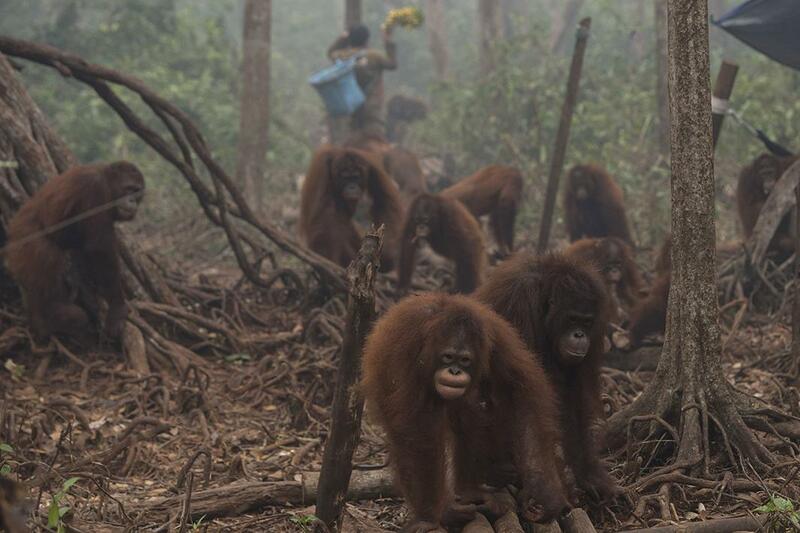 Orangutans walk as haze shrouds Borneo Orangutan Survival Foundation camp in Nyaru Menteng, Indonesia’s Central Kalimantan province, Oct. 5, 2015. Indonesian military personnel spray water on a burned forest area at Rimbo Panjang Village, Kampar, Riau, Indonesia on Aug. 6. 2015.